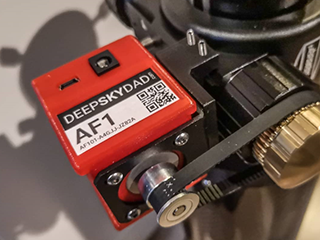 DeepSkyDad AF1 is a budget-friendly belt driven autofocuser unit, intended primarily for astrophotography. As such, it does not include any kind of physical remote controller. It comes with stepper motor, MXL pulley, MXL belt, printed PCB circuit and very compact enclosure, which enables a lot of freedom when mounting. Mounting adapters are 3D printed and can be custom designed as per customer requirements. It is fully open sourced. Direction: Focus IN or Focus OUT. IN decreases ticks count, OUT increases ticks count. Selecting this controls the direction of the Relative Position property below. Reverse Motion: reverse direction of the motor, if focus in/focus out are reversed in relation to the focuser physical movement(depends on how the autofocuser is mounted). Max. movement: maximum position change in a single movement (in steps). Settle buffer: if set, focuser returns "IsMoving" as TRUE for specified time (in ms) after focuser reaches target position, letting it to settle a bit. Useful if your focuser has any play. Coils mode: Always on (recommended) - coils are powered at all times. Idle - off - coils are turned off when focuser is not moving. Idle - coils timeout (ms) - coils are turned off after a specified amount of time from the last move. Coils mode: there are some scenarios when coils can be turned off after a period of time (e.g. manual focusing via software). But generally, we recommend you to use Coils mode "Always on" for autofocusing procedures, as turning the coils off results in lost position of the motor. Additionally, if coils are turned on at all times, motor holds the focuser position and prevents slipping. when coils are powered (e.g. Coils mode "Always on"), the stepper motor is producing a hissing noise, which is perfectly normal. With holding current set to 100%, motor can get a little warm after a while.